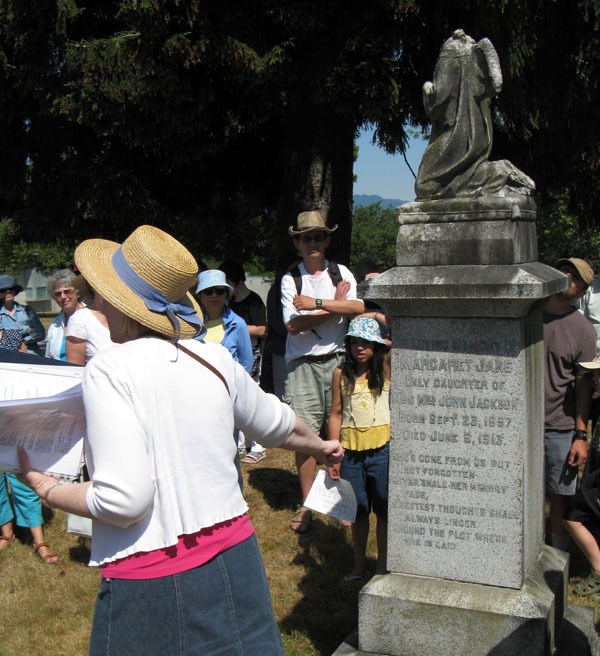 Mountain View Cemetery in Vancouver, BC, invites you to its open house, er, cemetery next Sunday to explore and experience “award winning architecture, kites, tours, and hungry ghosts.” I attended last year (and wrote about it here), and it was a blast. Live music, tours, fellow taphophiles, kite making… what’s not to love? If you’re in the area, definitely check it out. Lorraine Irving of the BC Genealogical Society gives the history of this many-times vandalized angel monument at last summer’s open house. Posted by Meg Holle in Cemeteries and tagged tours. Bookmark the permalink.